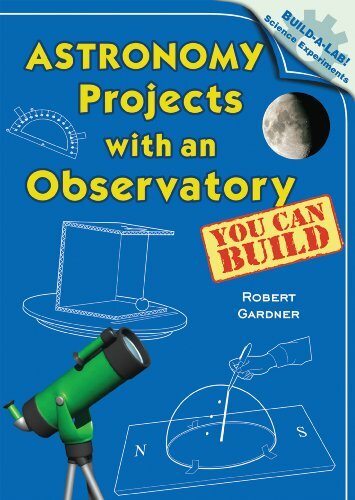 This is the book to tell the intermediate-level amateur astronomer what he needs to know about observatories. It draws on the author’s practical experience and that of many other experienced amateur astronomers. 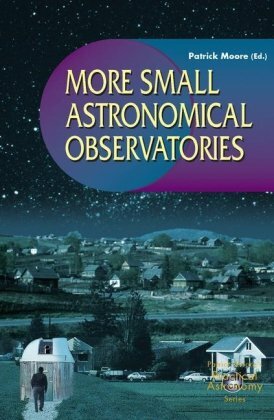 It is an ideal complement to Patrick Moore’s More Small Astronomical Observatories which is a compendium of ideas for different observatory designs. Setting-up a Small Observatory covers the details of design, siting and construction once a basic type has been decided upon. It is written in a way that is equally applicable to the USA and UK (where there are slightly different building regulations) and deals with matters that are basic to building and commissioning any amateur observatory. Uniquely, David Arditti also considers the aesthetics of amateur observatories – fitting them in with family and neighbors, and maybe disguising them as more common garden buildings if necessary. Every amateur astronomer who wants a purpose-built observatory (and that is most of them!) will find this book absolutely invaluable both during the planning and the construction stages. Lots of really good anecdotal information! I totally enjoyed this book! There were many helpful tips and observations from authors that have "been there and done that!" One of the other reviewers noted that he thought this was "padded" with extraneous information. I would disagree because I found much of the surrounding information thoughtful and additive to my project. Ultimately, some of the "additional information" has already saved me some serious money! The topic is well described and has some brilliant ideas. I am buying a second copy for my son's project. Perhaps it will cover an item or two that was not obvious and save an expensive mistake! Well, the book definitely provided the information it promised. I feel much more prepared to build my own observatory now. But it strayed from the stated subject often and filled up pages with astronomy and telescope information that is available elsewhere. I got the feeling that it was padded - or maybe just mistitled. Maybe it should have been called "Setting-Up a Small Observatory: From Concept to Construction and a Bunch of Other Stuff You Probably Already Know Since You Are Considering an Observatory of Your Own Anyway". Don't hesitate to buy it for the information you need.Just be prepared for a bit of wandering. If you are looking for information about how built an amateur observatory, here you have all you need to know. Sir Patrick Moore adds another wonderful book to his many!Anyone sincerely interested in configuring and erecting a custom observatory would find this invaluable.The initial offering is now out of print, but the editors and Sir Moore have kindly included a CD rendition of it. This book is not a step-by-step guide. Moore never says it would be. It allows you to see what others have built and get ideas for your own observatory - what is a better/different way to do what I want. An added bonus is that his first book (Small Astronomical Observatories) is included as a CD in the back (I had been looking for it for a while with no luck). Most observatories are going to be of simple construction. If you can drive a nail and cut a piece of wood, you are well on your way. A bit of cement work and you are 99% there. I used information from 4 units to design my own. Yes, some of the designs are on the internet and he gives web addresses where they exists. 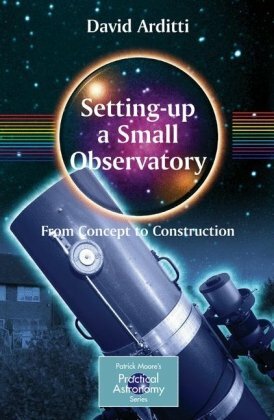 It meets my needs for information and I would not hesitate to suggest this book to anyone thinking about building a small observatory. Almost every amateur astronomer who has taken the pursuit to its second level aspires to a fixed, permanent housing for his telescope, permitting its rapid and comfortable use and avoiding hours of setting-up time for each observing session. A roll-off roof observatory is the simplest and by far the most popular observatory design for today’s practical astronomers. Building a Roll-off Roof Observatory is unique, covering all aspects of designing a roll-off roof observatory: planning the site, requirements for viewing, conforming to by-laws, and orientation of the structure. The chapters outline step-by-step construction of a typical building, and the accompanying CD-R provides complete, professional, detailed diagrams for each phase of construction. The author is both an amateur astronomer and professional landscape architect, and thus is almost uniquely qualified to write this fully-detailed book . A professionally designed roll-off observatory could cost as much as $3000 just for the plans – which are provided free with Building a Roll-off Roof Observatory! Real, existing buildings have been built from these plan-sets, with photographs to show how they turned out. At present there is no published book with the same degree of detail and expertise that this text offers the amateur astronomer. Three sets of scale plans are provided on the CD-R that accompanies the book. Full-size prints of the plans are available from the author, along with a bespoke design service if needed. This is a great source of information about the subject. It is well illustrated and the text correctly references the pictures. There is helpful information about location, design, and other things you might not have though about. 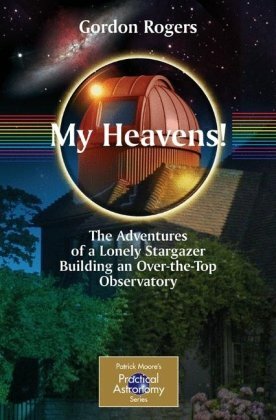 I highly reccomend this book to anyone considering building a backyard observatory. It also comes with a CD that contains all the illustrations in the text along with detailed plans for construction. If you own a large telescope, you'll want an observatory for it so you won't have to set it up every time you want to use it. (You know what I mean!) If you have plenty of money, there are many nice observatories to choose from, but if you are on a budget, then building a roll-off roof observatory is probably your best option for utility and cost. 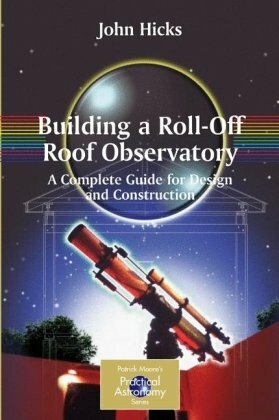 'Small Astronomical Observatories' is not your ordinary astro book.It shows you a number of different observatory designs, but assumes you already have knowledge of key construction concepts.Spherical andpolygonal domes, roll off roofs and some unusual designs are included inthis book (which were built by amateur astronomers).There are even blueprint type diagrams for a few of the designs to help you get started andmake your own design decisions. Well worth buying. I loved this book, and I look forward to future vacations where I can include a site or two that are mentioned in the book.The chapters cover Native American astronomy sites, optical telescopes, radio telescopes, planetariums, NASA-related sites, space museums, and sites related to a select few people that are important in the world of astronomy.Each location includes a description of what you'll find at the site, and practical details like how to get there and the hours that the location is open.While this is not a comprehensive review of every possible astronomy-related location that exists, it seems like a good beginning. 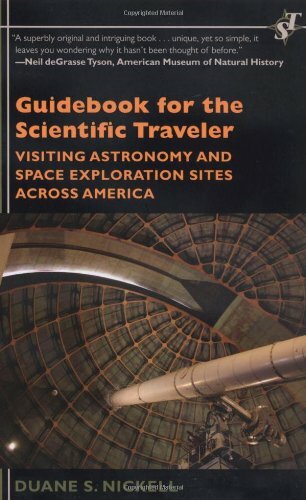 I like this book over-all, it has a lot of great information about visiting observatories and science locations. 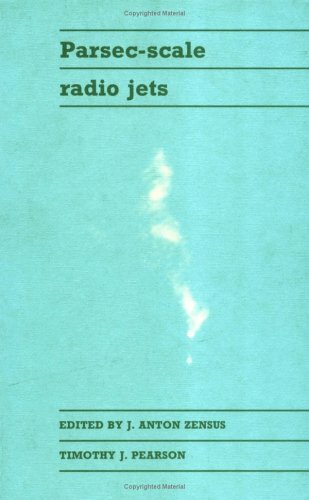 For example, I've been to Mauna Kea and Palomar Mountain, and I learned some new information about visiting them from this book. Each site is introduced with a good description of the historical and scientific character of the facility, and there are pointers to special features or easily missed displays that are worth hunting down. As a Bay Area resident, I have a major gripe: While the book lists Ames Research Center in Mountain View and Lick Observatory near San Jose, it ignores Chabot Space and Science Center in Oakland. This is puzzling, since both Ames and Lick have very limited options for tours by the public - Lick is open during the day, but only has night time viewing on a few nights each year. Ames has a nice visitor center, but the only time you can get inside the gates is for the Air Show (or to film a MythBusters episode). To contrast, Chabot is open to the public most days of the year, and has public telescope viewing every clear Friday or Saturday night. The planetarium and Mega-Dome theater are world class. 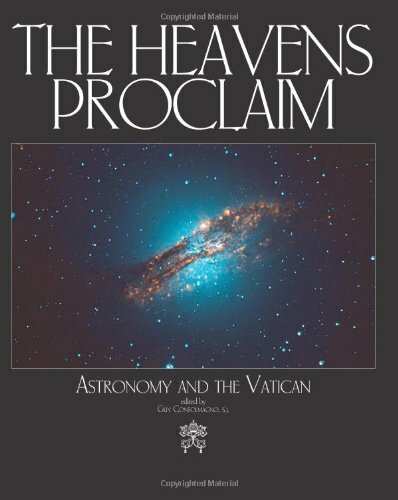 For telescopes, Chabot's 20" refractor and 36" reflector dwarf the telescopes available at most public observatories, including some that are praised in this book. The book includes a section on visiting Roswell and Area 51, this is good for amusement value. There are also pointers for visiting some of the great space related museums and NASA facilities. The last chapter is a helpful list of ways have fun with space science - I can vouch for the joys of star parties and solar eclipse travel, but I will have to delay the sub-orbital flight until the prices come down. 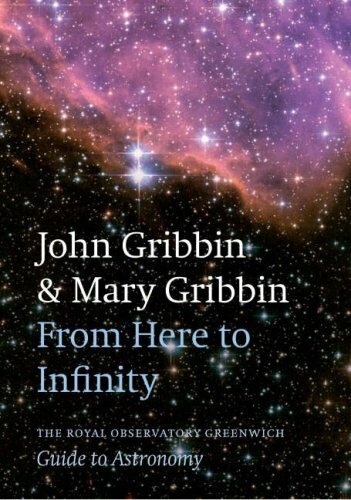 Overall I think this is a useful and interesting book, but make a point to check out the Chabot center if you are looking for astronomy in the San Francisco Bay area! Comprehensive profiles of the 57 most important observatories in the world, including 10 space-based telescopes. Great Observatories of the World is a comprehensive tour of the 57 leading observatories located in the United States, Europe, Chile, Australia, India, Japan and the vast reaches of space. The book begins with a brief and engaging history of the telescope and observatories. It covers 36 Earth-based observatories and their history, mission, type of telescope and other observatory equipment, and significant discoveries. It then features 10 space-based observatories, including the Hubble Space Telescope and the Chandra X-Ray Telescope, which have been mounted on space probes to monitor some of the universe's most mysterious events. The final section covers 11 observatories of the future, including both Earth-based and space-based telescopes, and how partnerships between nations and private institutions fund ambitious projects of unprecedented size and responsiveness. 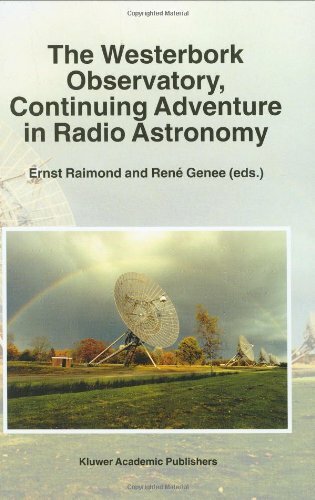 The book also provides fascinating information on:- Spectroscopy and radio astronomy- The effects of atmosphere on astronomy- Coronagraphy and solar observation- Astronomy careers and training- Locations and websites of the world's 100 largest observatories. This book had the potential to be great. 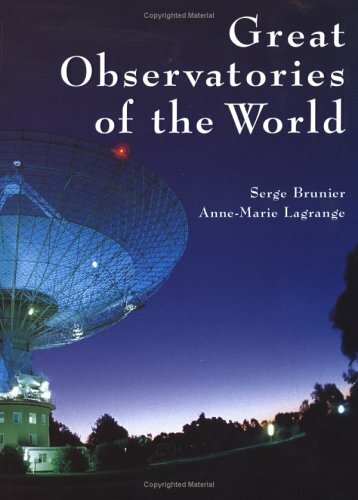 And its a great book for the observatories that are covered. But the omission of some of the really GREAT observatories was a bit of a disappointment to me. There is about 3/4 of a page on Palomar. And even that is somewhat inaccurate. Better titled "Some Observatories of the World"
OK, it's a good-looking book with lots of great shots of interesting research observatories around the world.My great disappointment is the near-complete absence any mention of the Palomar Telescope, except for a brief mention in the introduction. Or Kitt Peak for that matter.Or any number of architecturally important observatories. I can't explain how they chose the contents of their book, or why they devoted an entire section of the book to telescopes that haven't even been built yet. This book is fun to read, and a lot can be learned from it, but beware of the numeric errors: do not trust dates, sizes, distances. Common errors include: billion sometimes means 10^9 and sometimes 10^12, distances to galaxies are completely wrong (e.g. 10 light years to M82), use of thousand instead of thousandths, and multiple others. 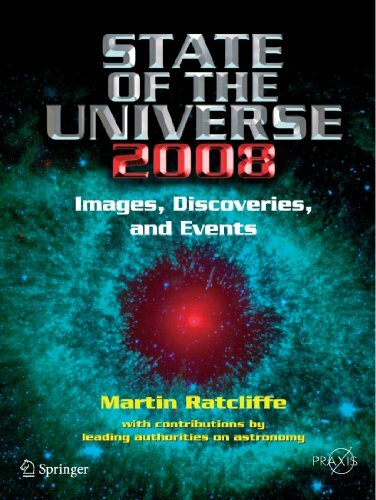 Analyzing the planets of our solar system as well as the wider universe, this definitive reference provides an unparalleled understanding of all aspects of astronomy. From straightforward questions regarding the distance of stars and Galileo’s discoveries to theories on the possible expansion of the universe, this examination is sure to appeal to both amateur astronomers and space buffs. Beautifully photographed and illustrated with detailed diagrams, this is a highly authoritative and fascinating guide to one of the most exciting areas of scientific research. This is an excellent historical account of the behind the scenes details of NASA's HEAO missions.The author is not just a writer assigned to write the book, but a scientist as well.Although many scientists or engineers that write about their projects are too technical, Wallace H. Tucker, has a good balance between the technical and layman's writing style.Although there are places in the book that have become out dated, due to new observations, it still gives one a good starting point into the world of High Energy Astronomy and the methods used in the HEAO spacecraft to study this portion of the Universe. 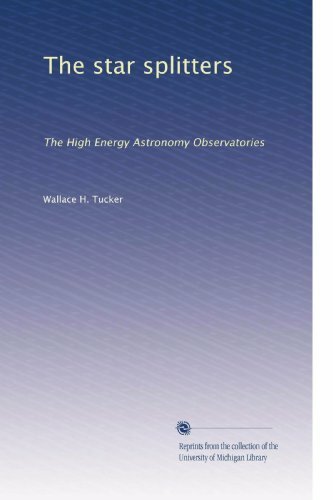 This book published by NASA (NASA Special Publication, NASA SP-451) in early 1984 describes the High Energy Astronomy Observatory (HEAO) Missions which were developed to examine and analyze the nature of the high energy universe, stellar radiation and galactic radiation.Some of the topics covered in this book include creative violence, stellar explosions, cosmic rays, superbubbles, stellar coronas, collapsed stars, neutron stars, degenerate dwarf stars, black holes, X-ray images of galaxies, galactic nuclei, spiral galaxies, galactic clusters, the mystery of the missing mass, and cosmic fire.The book also covers the design of the mission, the spacecraft and the spacecraft instruments. It is important to note that while this book has been out of print for many years; many excellent quality used copies of this book in hardback are available cost between $10 - 25. 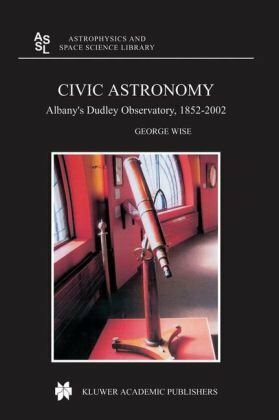 George Wise did a great service in producing a marvelous book that will be read probably by few, yet fills and important gap in the history of science for the public in America.There is no doubt that, more than any other country, America values an educated lay public, and the efforts of the citizens of Albany, New York, to create a world-class observatory in the 1850s is known by few.However, this volume, more encompassing than "Elites in Conflict", shows on the one hand how intense the struggle can be to professionalize a scientific field on the one hand, and make it accessible and appealing to the public, on the other.With access to archival material necessary to make such a broad ranging survey, George Wise has distilled the over 150-year history of the Dudley Observatory into a fairly brief but well-documented study.